You just got a call from your mother in law and she’s about to show up at your house to drop off new clothes she bought for your kid. Taking one look at your home your heart races and you frantically try to clean your house spotless before she arrives. 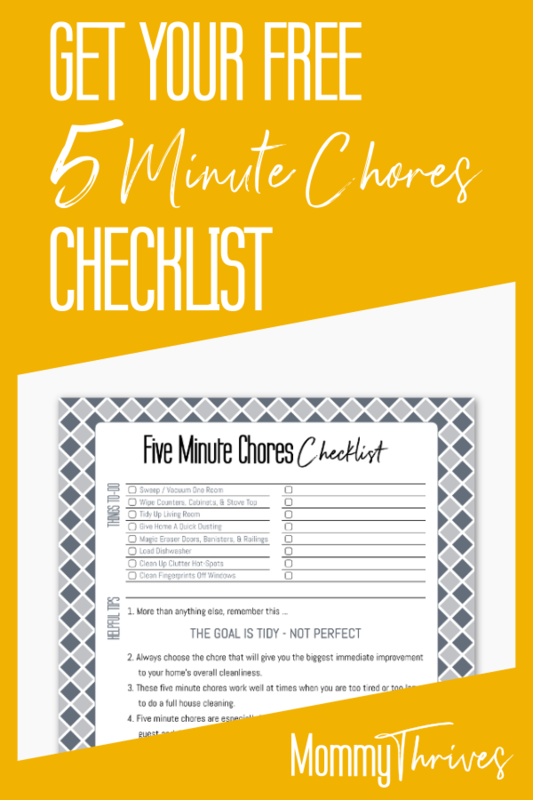 You need 5 minute chores to make your house look clean faster. 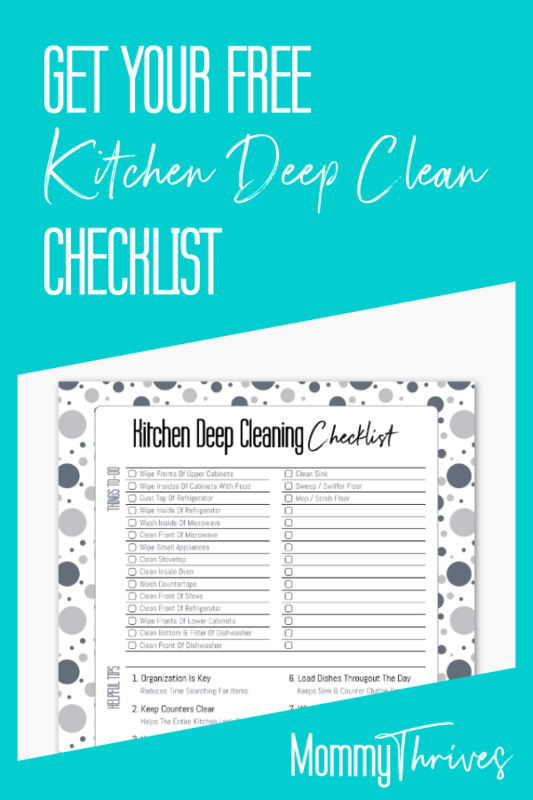 As someone who rather enjoys spending less time cleaning and finding faster ways to keep my house cleaner I have the list for you. There are loads of reasons why you may only have 5 minutes to clean up your home. It could be an unexpected visitor or a busy schedule. It could even be that you only have energy for a quick burst of cleaning. Lucky for you I have a 8 things that only take 5 minutes or less to do. Doing just one of these 8 things will make your house look a lot cleaner. You just have to make sure you are picking the one thing that will make the most difference. One thing that I learned in business was the term Return On Investment. Investment in business or finance usually means money invested. The goal is to have an investment give you more money than the initial investment. I like to look at this term in all aspects of my life. It’s about finding where I can reap the most in the time I spend on things. So if I have a busy day and a messy house I look at the mess and decide where I can spend the least amount of time but see the biggest impact. I have an open floor plan so my kitchen opens up into my living room. This means if one of these two rooms is a mess the other one will also look like a mess. If my preschooler has made a mess in the living room with toys a 5 minute tidy in the living room can mean all the difference in making my house look cleaner. On the other hand if I have dirty dishes in the kitchen taking 5 minutes to load the dishwasher can have the biggest impact of cleanliness. So when you only have a few minutes to clean up your home take a look at what is causing the house to look messy and focus only on that. Like me you probably have a kid or more, you might have furbabies, and you are a busy person. The reality is there are more important things to do than keep a perfectly clean home. You have 10 different jobs to report to on any given day and you need to keep your sanity through all of it. Having a spotless home just isn’t always in the cards. We all know a few short minutes after your sink is emptied, or the laundry is complete, or the living room is made perfect, it will get messed up again. There is no reason for you to drive yourself absolutely crazy trying to keep it perfect. Furthermore, you are not allowed to feel guilty for not having a perfect home. While I remember how my mom used to keep a clean home my best memories of my childhood are not the clean home. They were all the times my mom and I talked, hung out, laughed, and had fun. I remember root beer floats when my first boyfriend and I broke up. Or her helping me to fix my bright orange hair when I first failed at bleaching it. I remember her very real lesson on racism when I was in 1st grade. Also, the time we went camping with my girl scout troop and she handed out cotton balls of toner so we could all clean our faces. Your perfect home is not going to be the focus of your kids memories. This is why we go for tidy, not perfect. All timed chores may fully depend on the size of your house and how much you have in your house. These chores are not meant to be deep cleanings but small things you can do in a short period of time in order to make your house look cleaner. Remember, we are going for tidy not perfect. A clean floor could make all the difference in your house looking clean. On any given day crumbs, dust, and dirt enters your home and spreads throughout your home. If you have animals in the house their fur will collect in clumps in corners. A quick 5 minute sweep or vacuum of your floors can make your whole house look cleaner faster. For my floors I usually take 10 minutes to sweep the entryway and kitchen onto the carpet in my living room and then do a quick vacuum of my carpets. I love my Shark vacuum because it picks up dirt, dust, and crumbs off hard wood floors with ease. With pets and a toddler having a vacuum that switches from one type of flooring to another makes cleaning all that faster because I don’t need to sweep my hard wood and then vacuum my carpets. When counters are dirty they can make your whole kitchen look dirty too. Cleaning counters in your kitchen provides a huge impact in making a home look cleaner. There are other reasons why cleaning counters is one of the better 5 minute cleaning tasks. Our kitchen counters are where our lives come together. We prepare our food, drop our mail, eat at them, and have conversations over them. Our counters are some of the most used places in our home and we touch them a lot. This means we should make sure they are sanitized office. Luckily it’s not a super long process. Use an antibacterial dish soap on a dishcloth. I prefer these microfiber dishcloths. Wash the counters using a circular motion, think “wax on and wax off.” Next you will rinse out your dishcloth and wipe your counters to remove the soap. Keep rinsing your dishcloth and wiping your counters till the soap is gone. It sanitizes your counters for food and household safety. A messy living room can make a whole home look messy. You can have freshly vacuumed carpets but your living room may still look messy. This mess can come in the form of toys, throw pillows, or blankets on the floor from your children playing. It could be a stack of newspapers or magazines on your coffee table. It could be items that belong elsewhere in your home migrating to your living room. I like to use a large laundry basket – like this collapsible one – to do a quick declutter and clean in my living room. I put the laundry basket on the coffee table or sofa and put all items that do not belong in the living room in the laundry basket. Once the room is decluttered I fluff the pillows on the sofa and fold the blankets. Then I take the basket and put everything in it away where it belongs. Then I collapse down the laundry basket and stick it in our coat closet for the next time I need to tidy up the living room. This small act can make a home look a lot cleaner and fast. A quick dusting of your whole house not only helps you and your family to breathe easier but it keeps your furniture looking good too. Dust can gather on top of furniture, mantles, picture frames, plants, and ceiling fans. This dust will make everything look dingy and dirty. Take 5 minutes and a duster to wipe down all surfaces of your home to remove the dust. It a small thing that can have a huge impact on the cleanliness of your home. We often overlook our door jams, doors, railings, banisters, and door handles. Not only do these surfaces hold germs and bacteria they can quickly get dirty too. Wet down a magic eraser and squeeze out excess water until it is just damp. Go around checking all your doors and the walls near the doors, use it to clean up banisters and railings, and clean all your handles. This simple task can brighten areas that are usually left untouched for months at a time. Dirty fingerprints on walls and doors while often overlooked still make a room look messy. So take 5 minutes to stay on top of this. Simply loading your dishwasher takes no more than 5 minutes, especially when you stay up on it. Getting dirty dishes off your counter tops and out of your sink make the whole house feel cleaner. Loading your dishwasher helps to keep the smell of dirty dishes locked away until it’s time to run your dishwasher. When you leave dishes in the sink it can create a smell in the house that’s hard to get rid of. Especially if you cook especially fragrant dishes like curry or mexican. Clutter hot spots are places where paperwork and other items gather in your home. This can be entryway tables, end tables, counters, and coffee tables. Often these places will gather items over the course of several days or even weeks. Take 5 minutes to file your paperwork and put away items that gathered in this hot spots. It can mean a world of difference in the cleanliness of your home. Windows bring light into our home and allow us to see what’s going on outside. If you have animals or kids though then you know how dirty those windows can get. Taking just 5 minutes to wipe off fingerprints can bring in more light and make your room feel cleaner. Taking 5 minutes every day to tackle a small chore can change the amount of time you spend cleaning your whole house weekly. The biggest reason why our houses get messy and feel messy is by the end of our busy day in our very busy lives, we are just too tired to lift a finger. So if we can donate the smallest amount of time to a task every day we might be able to lessen the amount of time we spend cleaning on our only days off. Remember, we all have days when the last thing we want to do is clean our house. Sometimes it’s best to just ignore the mess and do something the next day. You have to make sure that you take care of yourself too. So if you are super tired, go to bed early and worry about cleaning up the mess the next day. Do quick chores help you to keep your house cleaner? Let me know in the comments below. Follow me on Pinterest for more like this and make sure you pin this to your cleaning and organizing boards.